All the things you need to protect and play you Godin guitar. 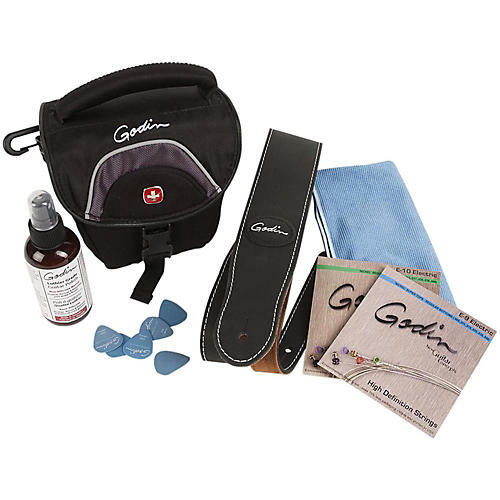 The Godin Guitar Accessory Kit is a rugged Swiss gear compact carrying bag with Godin logo packed with all the accessories you need to get playing right away. It includes a 4 oz. bottle of Godin Luthier Grade Guitar Polish, microfibre polishing cloth, Godin black padded leather and suede strap with a patch logo. It also includes two sets of Godin High-Definition electric guitars strings: Godin E-9 Nickel Super Tops - Regular bottoms (.009, .011, .016, .026, .036, .046) and Godin E-10 Nickel Regular Light (.010, .013, .017, .026, .036, .046). Finally, you get a 12-pack of Godin branded high-quality Duralin guitar picks which are medium-heavy (0.99mm).